My relationship with cabbage is as unavoidable as my relationship with beer; I’m part Slovak, part German, and I cavort with–and married–a woman of Irish decent. Cabbage (and beer) runs through my veins and out multiple orifices. When I was growing up, at least once a week I could walk into my grandmother’s house to the smell of haluski cooking on the stove. It was the best! Cabbage, noodles, butter, potatoes, and more butter formed to make a buttery explosion of calorie dense carby goodness. Sadly time enjoying things like homemade haluski, pierogies, and cabbage rolls came to end about twelve years ago when my gram passed away at the age of 89, but my love of cabbage continues. I have no doubt that my cabbage and noodles would have my grandmother saying “Jason… P-pppllllease, don’t do that!” in the same way she did when I would mess up her tufts of cotton white Einstein-like hair. Sorry granny, but if I can’t have yours, I gotta make it myself, and make it my own. Mine is more Slovak-Asian-Fusion (that’s so in right now according to Bon Appétit magazine). So with all that said, here is my White Trash Slovak Soiled Cabbage & Noodles. It’s a colon strong, not so homemade, super fast, and a slightly healthier version of a classic. 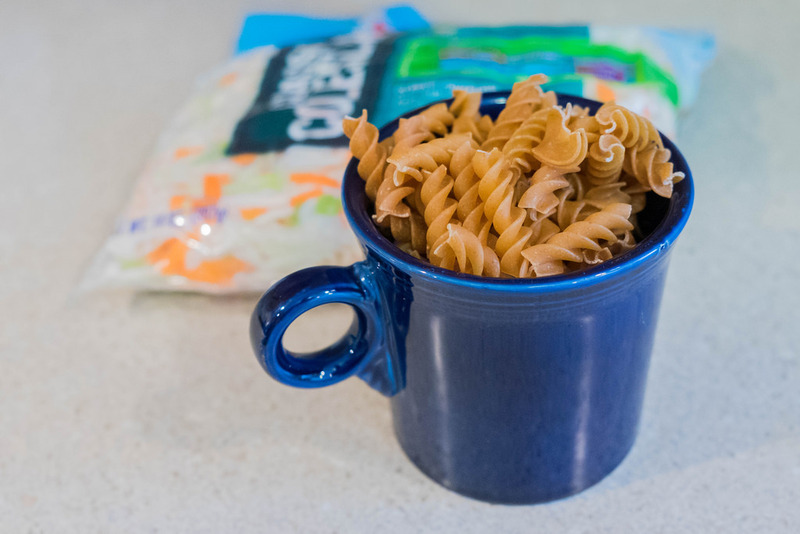 1 (rough) cup of whole wheat pasta (dry). I think that makes like 32 oz. of cooked (or not). I use Ronzoni rotini because it seems to cook up super fast. Bring a pot of water to a boil and add pasta, cook according to directions. 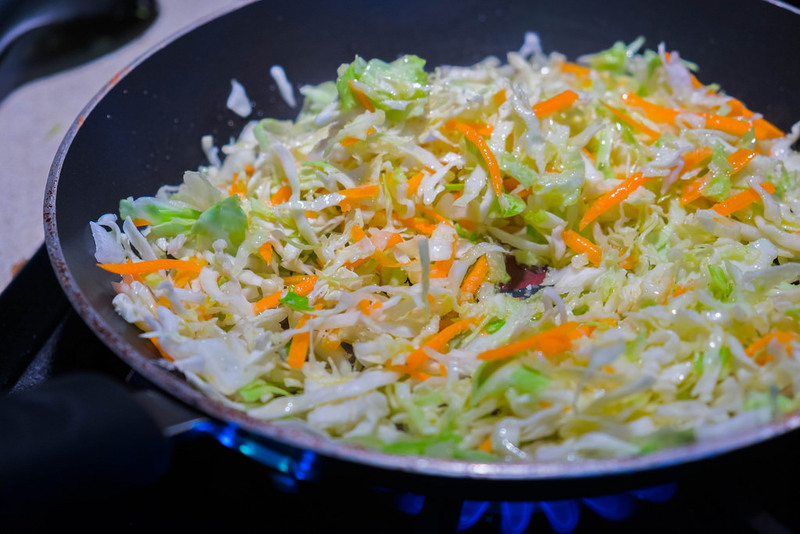 Add slaw mix to a pan, stir in olive oil, and stir fry until tender. Drain pasta and add to cooked slaw. Add a couple of shakes of teriyaki sauce or soy sauce and mix thoroughly through. Salt and pepper to taste. Don’t be shy with the pepper! 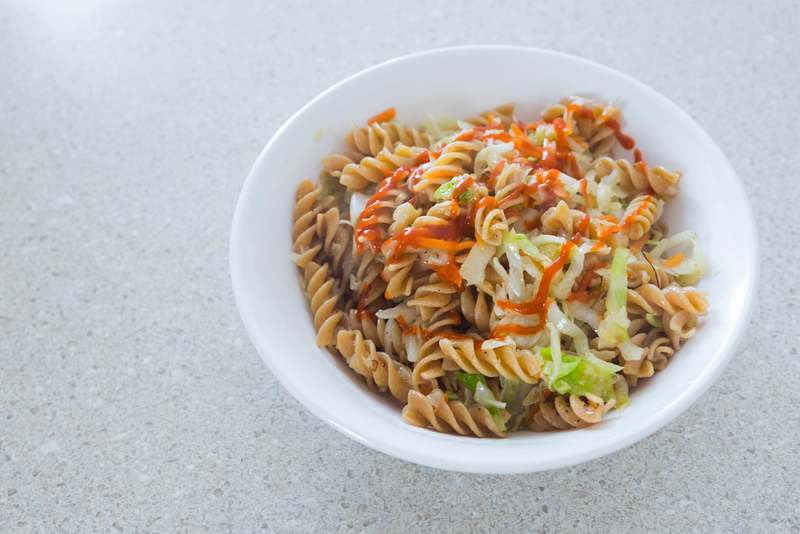 Serve and top with a swirl of sriracha sauce to spice it up a bit more.